The majority of Americans do not want their children to become a public school teacher — and these quotes are just some of the reasons why. 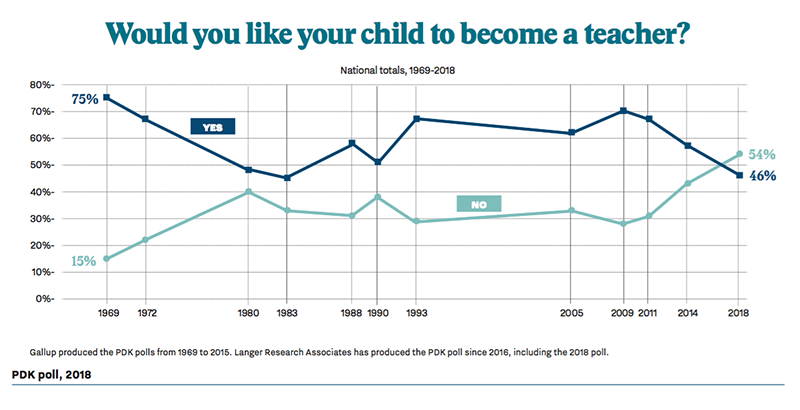 They come from the 50th annual PDK International Poll on public attitudes toward education, and it’s the first time that the majority of people — 54 percent — want their offspring to steer clear of a career in education. “The pay is low. The conditions are tough. It’s not that much of a surprise,” said Joshua Starr, CEO of PDK International. That’s not to say the public doesn’t like teachers — quite the opposite. 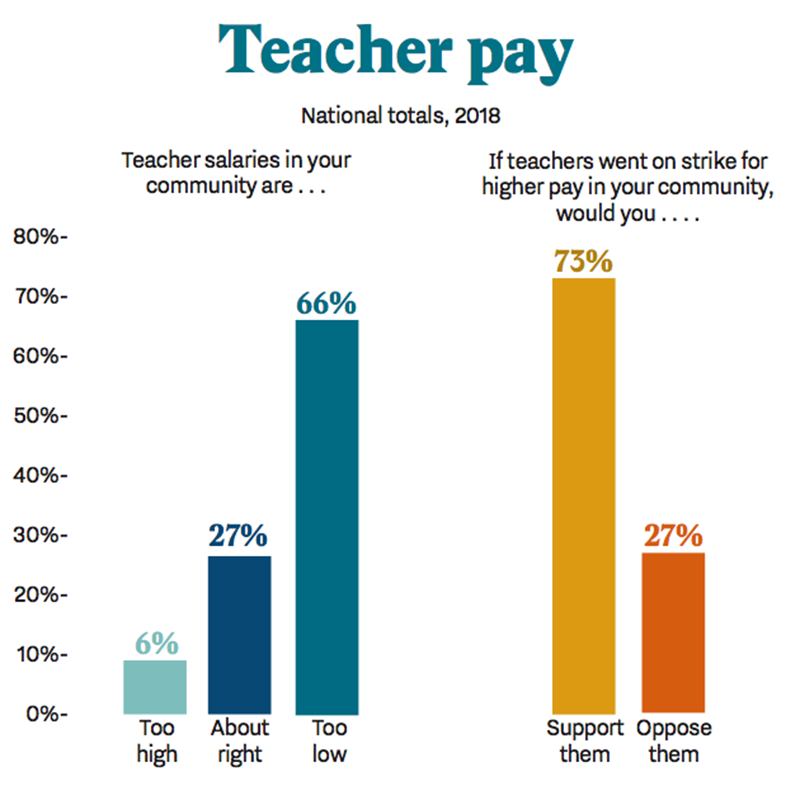 The majority of poll respondents have confidence in teachers, want them to be paid more, and support their efforts to strike. But in an open-ended question, respondents listed several reasons they didn’t want their children to enter the profession, the most common being poor pay and benefits and the challenges of dealing with student behavior. Democrats were more likely to list pay, while Republicans were more likely to list behavior. Not all parents felt this way, however. Hispanic parents were much more likely to want their children to become teachers, at 67 percent, followed by black parents, at 51 percent. Only 40 percent of white respondents wanted their children to be teachers. The PDK poll also saw a new high in the proportion of people who think teacher salaries are inadequate — at two-thirds. Only 6 percent think teacher salaries are too high, and one-quarter think they are just right. Three-quarters also said they’d support a teacher strike, though those who live in the South and the West are more likely to support walkouts than residents of the Midwest and the Northeast. Teachers across the country this past spring walked out of their classrooms demanding higher pay. A significant number are also running for office this fall to address years of declining funding for education. Starr noted a disconnect between how policymakers are funding schools and how the public feels about the importance of adequate funding. “Parents and the public feel in many ways very different than the discourse that’s happening today, which is a real concern for us,” Starr said. This poll’s findings are similar to those in the Education Next national poll released last week, which found a 13-point rise over the past year in support for increasing educator pay. Other PDK Poll findings include support for college affordability, with three-quarters of respondents favoring free tuition at community colleges and 68 percent supporting more federal funding for four-year schools. The poll also found that most Americans — 60 percent — think more funding should be spent on the neediest students, while 39 percent believe the same amount should be spent on every student. PDK previously released early poll results regarding school safety, which found that even though schools are safer than ever, the number of Americans who fear for their children’s safety has tripled over the past five years. The survey includes responses from a random national sample of 1,042 adults and has a margin of error of plus or minus 3.9 points. GfK Custom Research collected the data through an online survey and provided free Wi-Fi and devices to households that didn’t have internet connections.